Here's a thought experiment: Imagine you're running a major cable TV network and your fastest-growing distributor (and largest, by number of subscribers) offers to license your content for approximately $300 million each year, a sum that is about 10 times the amount it has been paying under the current deal struck less than 3 years ago. The new deal would have a very material impact on your P&L as your company's operating income last year was about $400 million. Seems like a pretty tough offer to turn down, right? However, there are certain catches. First, this distributor is considered a disruptive competitor by all of your other long-time distributors (who collectively paid you about $1.3 billion last year). If you proceed with this new deal, you're concerned that these other distributors may retaliate by paying you less when they renew their deals in the future. Second, this distributor wants a degree of exclusivity that limits your ability to make incremental deals with companies it deems as competitive. Third, key suppliers of your content have escalation clauses that entitle them to incremental payments if you proceed with this new deal, which would in turn erode your margins. And last, but not least, the manner in which this distributor wants to compensate you would alter the way you are positioned in the market - from a "premium" to a "basic" channel - consequently risking a perception that your content will be irreparably devalued by consumers and other distributors. Got all that? If so, then you grasp the quandary that Starz's executive team found itself in as it evaluated a huge license renewal offer from Netflix. Last Thursday Starz announced its decision, choosing to rebuff Netflix's rich offer, at least for now. But as the math below shows, combined with what I've learned from individuals familiar with Starz's economics, Netflix's putative $300 million/year offer was far more than Starz could generate otherwise, making its decision to walk away all the more difficult. In its statement, Starz said its "decision is a result of our strategy to protect the premium nature of our brand by preserving the appropriate pricing and packaging of our exclusive and highly valuable content." In other words, Starz wanted more than just big money from Netflix, it also wanted Netflix to change how it offered Starz content to its subscribers: from being part of an all-inclusive monthly fee (as it has been, starting at $8/month) to being available incrementally on a higher-level, more expensive tier. Starz's hope was that by aligning Netflix with how pay-TV providers offer Starz on various premium tiers, the above concerns would be ameliorated. 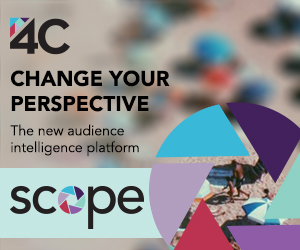 Premium tiers for networks like Starz, HBO and EPIX are important to the studios who supply these networks because they're a cornerstone of the "windowing" model that allows the studios to monetize their films multiple sequential times. In fact, Sony and Disney already had provisions in their agreements with Starz that would trigger as Netflix grew bigger (this is the reason Sony's movies were pulled from Netflix a few months ago). The problem with premium tiers is that consumers have to be persuaded to subscribe to them, an increasingly difficult challenge as basic services have grown ever more expensive. Between the sluggish economy, proliferating ways of accessing films on various devices and historically high churn rates, being on a premium tier means that only a relatively small percentage of addressable homes actually become paying subscribers. 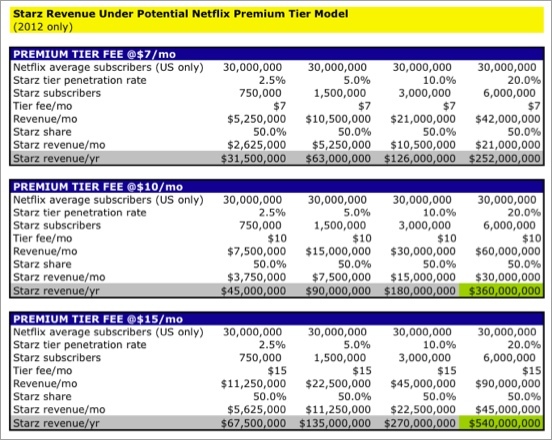 To help understand how much revenue Starz may have made from being on a newly-created premium tier from Netflix, I've created 3 scenarios below based on potential tier prices of $7/mo, $10/mo and $15/mo at 4 different penetration levels, 2.5%, 5%, 10% and 20%. I assume Starz would keep 50% of the revenue generated, which is probably generous. Note that only 2 of these scenarios - full 20% penetration, at $10/mo and $15/mo - generate revenue for Starz that exceeds the $300 million Netflix was offering to keep Starz available to all of its streaming subscribers. And the likelihood of achieving these levels is practically zero, since they would entail Netflix more than doubling the total monthly fees these subscribers would be paying, significantly dampening interest. In fact, it's virtually inconceivable Netflix would even go down the premium tier path in the first place, since it would mean pulling out and charging more for prized content that has been available as part of its core service. Think about the uproar caused by Netflix's recent move to charge separately for DVD and streaming and you get a sense of the revolt that would ensue. Stepping back, the $300 million would have paid Starz the equivalent of about $.83 per Netflix subscriber per month, assuming an average 30 million Netflix streaming subscribers in 2012. That amount would likely place Starz in the lower part of the top 10 of basic cable networks, in a range with USA Network for example. But this would be only about 20-25% of what Starz gets from other pay-TV operators that distribute it as a premium network. The fundamental incompatibility of Starz being treated as a basic network by Netflix, while trying to maintain its position and value as a premium network by all other pay-TV distributors is where this renewal deal broke down. Despite the fact that Starz subscribers have actually nudged higher since the original Netflix deal went live, and that there's no tangible proof that it has actually caused any cord-shaving or cord-cutting, pay-TV operators have made no secret of their unhappiness that Starz's content is available at a far lower price point via Netflix. A big new multi-year renewal deal would have raised all kinds of risks for Starz. In particular, how Starz's 3 largest pay-TV distributors, Comcast, DirecTV and DISH Network, which together accounted for 56% or $744 million of Starz's 2010 revenue, might react to a new Netflix deal was no doubt upper-most for Starz's management. What if, when it was time for them to renew, they each cut their offers by 25%? That alone would mean almost $190 million in lost revenue by Starz. And if other distributors were emboldened to play hardball, the full $300 million in gains from Netflix could quickly evaporate. Then there's the ire of Sony and Disney Starz would have to contend with, plus the higher payouts to them that would be triggered. And finally there's the opportunity cost of not being able to pursue incremental deals with Amazon, Wal-Mart/Vudu, Apple and others due to some degree of exclusivity that Netflix was requiring. In this context, although the $300 million from Netflix was almost certainly more than a premium tiered approach would generate for Starz, by insisting on it as a renewal condition, Starz was clearly more focused on the multiple risks to its existing ecosystem of partners than on the prospect of guaranteed additional income. With the current deal not expiring for another 6 months, there's still the possibility of a resolution between Starz and Netflix. Like many other content providers these days, Starz is walking a tightrope trying to balance rich new online opportunities with the value of its traditional partners.